Worshipers leave the Islamic Center of Murfreesboro after midday prayers in Murfreesboro, Tenn.
NASHVILLE - The two-year struggle between the Islamic Center of Murfreesboro and a group of residents who have fought a losing battle to keep it from being built paints a distorted picture of Muslim life in Tennessee, where several other mosques have opened in recent years with little or no controversy. Although there's likely no single cause for the conflict in Murfreesboro, the reaction of local leaders - both opponents of the mosque and those who stayed silent - may have helped extend and exacerbate it. Meanwhile, the experience of Muslims in Memphis, Chattanooga, Nashville and elsewhere in Tennessee shows that what happened in Murfreesboro is not the inevitable consequence of being Muslim in the Bible Belt. In some ways, the mosques in Murfreesboro and Memphis are similar. Both are planned as large community centers on a big tract of land in the suburbs. And both are next to Christian churches. The Memphis Islamic Center gained its own international media attention, for the opposite reason of Murfreesboro. When the Memphis Islamic Center bought land across the street from Heartsong Church, the pastor put up a sign reading, "Welcome to the Neighborhood." Encouraged by the gesture, Islamic center leaders met with church leaders and soon formed friendships, mosque trustee Danish Siddiqui said. It was a simple act, but it made headlines in a post-9/11 climate where one was more likely to hear about Muslim-Christian conflict than cooperation. Council on American-Islamic Relations spokesman Ibrahim Hooper said the pattern is similar across the nation, where a few high-profile conflicts mask the fact that many more mosques are being built without controversy. He cited the Park 51 mosque near ground zero in New York City, as well as mosques in Brooklyn, Chicago and Temecula, Calif., as some that have faced significant opposition recently. But, he said, "the vast majority of American Muslims are able to build their mosques in peace." In Memphis, the cooperation between the two congregations was so positive that they continue to work together on things like feeding the homeless, clothing drives, blood drives and even purely social events like a Super Bowl party. The groups also have set aside about six acres of land, three acres on each campus, to build what they are calling "Friendship Park." About 270 miles to the east, Chattanooga Muslims have had a similar experience. Just last month, the Islamic Society of Greater Chattanooga held the grand opening for a new mosque and community center. Board President Bassam Issa said the celebration included about 150 Christian supporters from local churches. "It was like one big family," Issa said. Issa, who has lived in Chattanooga for 39 years, said the community has always been welcoming to Muslims. "People, if you want to shake their hands, they hug you," he said. Murfreesboro Muslims say similar things about their town before May 2010, when construction plans for their new mosque were approved. The backlash was immediate and fierce. Upset residents filled the County Commission meeting, spilling out into the hallways. There was a demonstration and march against the mosque. Neighbors sued to stop construction. A piece of equipment on the site was set on fire. So what made the reaction in Murfreesboro different? One contributing factor is likely the Rutherford Reader, a weekly newspaper that often runs columns expressing concerns about Muslims. The hostility of those columns was such that local Kroger supermarkets banned the publication from their racks about the same time the conflict over the mosque was heating up. In June 2010, Kroger spokeswoman Melissa Eads explained the decision to The Tennessean: "We saw a consistent pattern of what we believed to be hate rhetoric." Then there was the congressional campaign of Lou Ann Zelenik, who made national headlines that same month when she issued a statement claiming the mosque, which she referred to as an "Islamic training center," posed a threat to Tennessee's moral and political foundation. After she lost the primary, Zelenik helped form a nonprofit called the Tennessee Freedom Coalition, which hosts movies and speakers warning of the threats of Islamic radicalization. One of its first events, in May 2011, featured Geert Wilders, leader of The Netherlands' far-right, anti-immigrant Freedom Party. In 2011, state Sen. Bill Ketron, of Murfreesboro, introduced legislation seeking to make it a felony to follow some versions of the Islamic code known as Shariah. To convince fellow senators to support his bill, Ketron distributed a DVD claiming Nashville Muslims radicalized a Memphis man who shot an Army recruiter after converting to Islam. The video, called "Losing Our Sons," was co-produced by the Tennessee Freedom Coalition. Stephen Fotopulos, executive director of the Tennessee Immigrant and Refugee Rights Coalition, said he thinks the seeds of conflict that took root in Murfreesboro are present in other communities, as well, but the response to the conflict by Murfreesboro's leaders likely has allowed it to grow. Fotopulos contrasted it to the response to the 2008 arson by white supremacists of a storefront mosque in the town of Columbia, about 40 miles southwest of Murfreesboro. After being welcomed at a local Presbyterian church for a few months, the group bought a new building with the support of people of many faiths from across Tennessee and across the country. "Not a day went by [after the arson] before there was a press conference with local leaders and law enforcement and church leaders saying: 'This is not what Columbia is about,"' Fotopulos said. "In Murfreesboro, I don't know what the mayor's position is on this, I don't know what the position of the Chamber of Commerce is." While there has been a movement to support the Murfreesboro mosque, most notably a large student organization, those voices have been largely drowned out by community leaders with a bully pulpit like Zelenik and Ketron. Still, Islamic Center of Murfreesboro members hope that the worst is behind them. 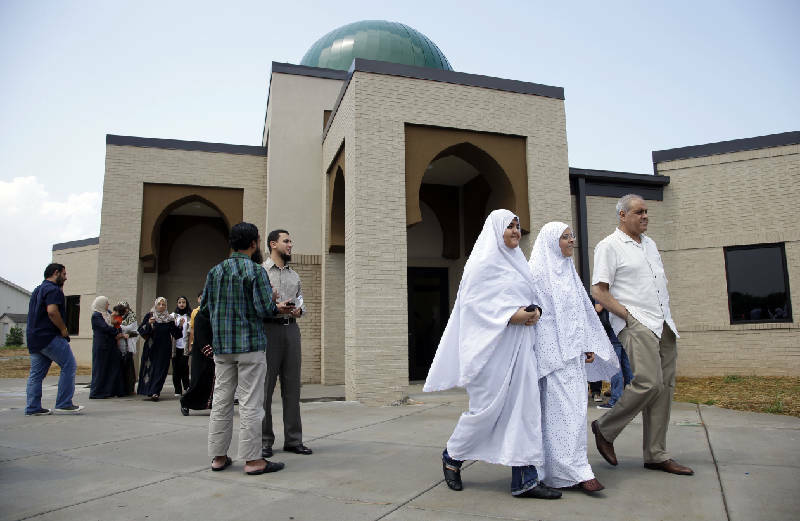 Although there is legal action pending, their mosque is complete, and members have begun to use it for worship, leaving a much smaller space in an industrial park where worshippers regularly spilled out into the parking lot. At the opening of the new building last month, member Matt Miller summed up the optimism of many when he said he thinks the opposition will die down once people "see that there are no underground tunnels. We're not here to take over the world. We just don't want to worship in a shoebox anymore."